Last season when the Vegas Golden Knights made it to the Stanley Cup Final without a captain, many people were wondering who would get the honor of lifting it first. Being a captain doesn’t necessarily mean you have to make a big speech before every game. It means your teammates and fans look up to you. You have to rally your team when they are in a rut and lead by example. As Vegas was an expansion team, they had no previous captain. This was an opportunity for many players to start fresh and really make a name for themselves. Below is a list of candidates who have a shot at wearing the first ‘C’ in franchise history. The first three names on this list would be the obvious choices because they have been with the franchise since it’s inception and currently wear an ‘A’ on their sweaters. Deryk Engelland is a fan favorite as he has played professionally there since he was in the ECHL with the Las Vegas Wranglers. He spent some time wearing an ‘A’ with the Calgary Flames as well, and he is known to stick up for teammates and isn’t afraid to say something when needed, like his speech to the Vegas crowd after the city experienced a tragedy on Oct. 1, 2017. The second alternate is Pierre-Edouard Bellemare. Much like Engelland, he is a meat and potatoes type of player. He does all the hard work along the walls, wins faceoffs, kills penalties, blocks shots, and leads by example. He is an unsung hero, a coach’s player, and a player that everyone listens to. The third player who has as much history with the franchise as the first two is Reilly Smith. He is a gifted offensive winger who creates plays by using his body and vision to find the open man and kills penalties for the Golden Knights. He is their leader offensively and does plenty of work with the community as well. The next three options include a previous captain of an Original Six franchise and two former alternate captains. 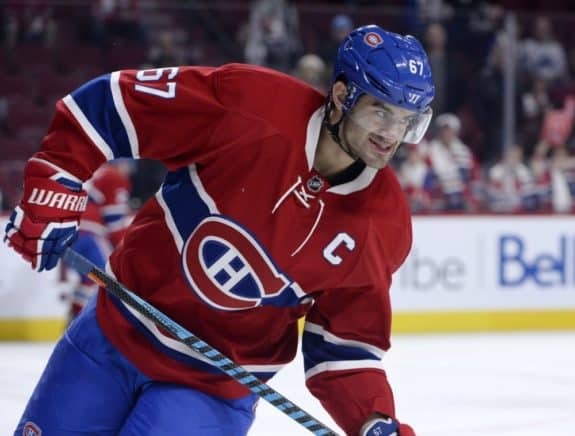 Max Pacioretty was acquired over the summer in a massive deal to help bring some firepower to the Golden Knights. He served as captain of the Montreal Canadiens for three seasons before being shipped out. Being captain of one of the most storied franchises in league history is a tough gig, and the US-born left-winger had the character and skill for the challenge. He is a leader and has averaged 30 goals a season in the past six seasons and will battle it out with opponents averaging 94 hits in that same time frame. Mark Stone was acquired at the 2019 Trade Deadline and has already made an impact with the club as they have won 10 out of the first 12 games they played with him on the roster. With some of the quotes General Manager George McPhee gave on his prized acquisition, it would not be surprising to see him don the ‘C’ in the future. Many expected he was going to be the captain for the Ottawa Senators after they traded Erik Karlsson, but the team elected to have three alternates instead. Paul Stastny was the big free agent signing by McPhee this summer and he has turned out to be a great fit. He is a face-off machine and his hockey IQ and vision on the ice are second to none. He previously wore an ‘A’ for the Colorado Avalanche and St. Louis Blues and he is another one of those players who the younger guys look up to. Stastny is the oldest player on the team in terms of games played, beating out the second place by over 200 games, and has seen the most playoff action of any skater on the team as well. These next three names are players who have made their presence felt on and off the ice and are a big part of the core. It is rare to see a goalie named the captain for the simple fact that the rulebook states they cannot wear the ‘C’. However, sometimes your strongest leader is the one who wears the biggest pads. 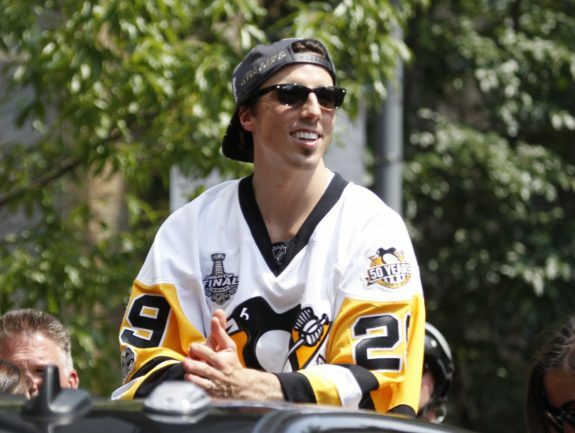 Marc-Andre Fleury would be a prime candidate because he is the ultimate competitor in net and a complete teammate in the locker room. When the Penguins decided to give Matt Murray the keys, Fleury was there to mentor the young netminder and stepped in to help his team win when needed. Alex Tuch was a player the Golden Knights received in an expansion deal with the Minnesota Wild to protect other players. Tuch has blossomed into a 20-goal scorer for the Golden Knights and is only 22 years old. He signed a seven-year contract extension at the beginning of the season, keeping him in Sin City until he is 30 years old. Having him in the fold long term gives him a chance to wear a letter. Shea Theodore is another player that the Golden Knights acquired in an expansion trade, this one with the Anaheim Ducks. He is their number one defenseman and a dynamic threat on the ice. He can skate, shoot, and move the puck with ease from one end of the rink to the other. In a common trend, he was also re-signed long term and will be a Golden Knight until he is 30. Theodore has previous leadership experience, wearing an ‘A’ in his third season for his junior club, the Seattle Thunderbirds, and being promoted to captain during his fourth season. The Golden Knights don’t have a shortage of leadership in their locker room. The team realized they don’t need someone to wear a ‘C’ to lead the team to victory. They know everyone has a role and as long as they stick to it, they will be successful. This is most likely why they were almost able to win a Stanley Cup in their inaugural season and are back in the thick of things for this season.